How to Achieve Long Term Conformal Coating Thermal Shock Resistance – It’s All About Selection! 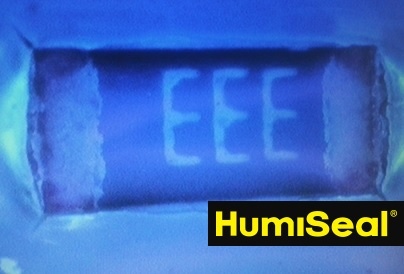 Does your conformal coating require long term thermal shock testing? Do you struggle to overcome cracking and adhesion loss with your current conformal coating after 1000 thermal shock cycles? With the drive for increasing functionality for end devices, and increased life cycles being placed on all electronic assemblies, the need to have materials endure more stringent testing becomes increasingly vital. Necessary robustness to these stringent conditions force suppliers like HumiSeal to innovate new material solutions to address these requirements. There are many conformal coating choices to pick from, but which one will help you meet your customer’s requirements best? Thermal shock testing is widely used as the most stringent indicator for qualification purposes of today’s most reliable PCBs. Standard technology conformal coatings are not designed to meet those needs and new technologies. Next generation systems, such as those found in the new synthetic rubber and UV offerings are needed to assure success. These relatively new product technologies provide resistance to long term thermal shock induced defects through improvements in the thermally stable physical properties such as CTE, Tg, elongation, and modulus. Thermal shock testing has traditionally been used to allow OEM’s to simulate long term life cycle performance. These tests are widely used in various industries where normal operating temperature can fluctuate greatly such as automotive circuit boards, outdoor lighting, and agricultural applications. Standard testing involves chamber temperature fluctuations between -40C to 85C, with temperature change gradient of 20C per min. There are some thermal shock tests with greater and lesser temperature changes, however the -40C to 85C seems to be most widely used. Long term thermal shock is considered to be greater than 1000 cycles with some reaching up to 3000 cycles. Most existing chemistries will not pass such stringent test requirements, therefore next generation conformal coating technologies were needed in these cases. Commonly observed thermal shock defects include: coating cracking, loss of adhesion, and blistering. These are caused by stresses that manifest as a result of the thermal excursions. Plastic deformation progression and adhesion loss are exaggerated with acceleration of temperature induced stresses. For example, blistering may start at a small localized point as particulate or residue on board which creates a lower point of adhesion. This small point is then stressed during thermal cycle and becomes a blister. The new technology coatings counteract the stresses by remaining more flexible and less susceptible to thermal stress induced defects. The synthetic rubber products are solvent borne and retain their properties during extreme temperatures. Applications include many coating and molding applications due to its high water repellency, flexibility and barrier properties. HumiSeal® 1B51, 1B58LU, and 1B59LU series have been specifically formulated for these purposes (see Synthenic Rubber blog to learn more). New UV-curable and VOC free coatings such as UV500 and UV50LV (qualified by BMW and Ford), were specifically formulated to help OEMs with thermal shock performance while maintaining their robust electrical performance. In conclusion, not one variable seems to affect the thermal shock performance, but it is the interaction between multiple properties that create improvement in performance. Product selection is your first and most important step towards achieving maximum thermal shock resistance of your circuit board assembly.